Our fathers, as our forefathers, used the word Telat to refer to an enemy who is totally alien. Telat was the totally other: the one that hails from distant lands, or perhaps from across the ocean. The word was used for a long while to refer to the Italians, who twice failed to conquer and colonize Ethiopia. The period before and after their second incursion during the years between 1936 and 1941 was often referred to as Ke Telat befit (before the advent of the enemy) and Ke Telat behuala [after the (departure/defeat of) enemy]. The word Telat connotes in the mind of Ethiopians not only alien-ness, but also one who has ominous powers to rain utter destruction and suffering upon them. One which could effectively end the very existence of their nation. Thankfully, since then, Ethiopia has not had another overseas’ colonial power to contend with, or to be subjugated, exploited and terrorized by; or much less one threatening her existence. Yet she is now under a more destructive, more predatory, divisive and destructive power than any she has faced in her long and variegated history. A Telat that rather see the Ethiopian polity end than lose its grip on power. A Telat that would rather ignite a fratricidal war than to submit to anyone else. A Telat that doesn’t even hail from afar, but is born right in the heartland of Ethiopia! Everyone is claiming that the TPLF doesn’t have the power and dominance it once enjoyed under its late leader Meles Zenawi. But the recent ratification of the State of Emergency suggests to any keen observer that the status quo has not changed at all. How else can one explain why the other coalition partners voted for the State of Emergency against their very own interest, clearly siding with the wish of their bosses in the TPLF, while ignoring the clamor of their constituents? Could they have done it out of political expediency? What on earth will they gain from it? Gullible and un-intelligent they are not! The only explanation for their action is that they are either deep to their neck in corruption and complicit in the crimes of the TPLF, or they are cowed by it. What other explanation could there be? A reasonably confident, independent, and relatively creditable body of legislators would have, without any forceful intimation, sided with the desire and wish of its constituents and presumed electors. By this particular act, the House of Representatives has unequivocally shown that it represents no one but itself. The objectives of the TPLF have been as clear as day light to any attentive observer from the day of its inception; or at least from the day it decided to expand its fight to the South. It is a party that had for a long time posited as its main objective the “liberation” of the Tigrean people from Ethiopia in order to create a separate republic as Eritrea. When this became a glaringly futile and self-defeating enterprise, it re-invented itself as promoter of ethnic federalism. Clearly, Tigray, despite her hardy people, could have never managed to sustain herself, let alone prosper without joining her fate with the rest of the nation. Frankly indeed, she needed the nation to survive more than the nation needed her. 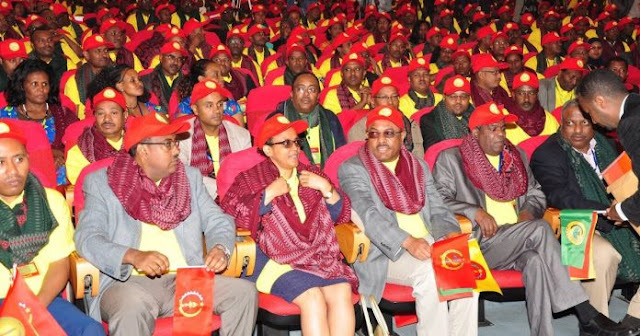 But the TPLF wanted to be seen not as the liberator of Tigray, but of the entire country. The truth of the matter is that it expanded the war not to liberate fellow Ethiopians, but to benefit itself and its kin. Ethiopians thus owe absolutely nothing to the TPLF. And if anyone is generous enough to consider their present overrepresentation in the federal government, bureaucracy, military and security, and the enormous wealth they have accumulated through predation as recompense for bringing about the downfall of the Derg, I say you are too naïve! I, like most of my compatriots, maintain that it deserves not a nod! On the contrary, we say that the time has finally come to claim the TPLF as our Telat par excellence; the one in fact that has made it clear that it would rather bring upon the nation devastation and destruction we have never seen in our recent or past history than relinquish power to any legitimately elected power! Every Ethiopian citizen must now consider the TPLF the number one enemy of the Ethiopian polity. It is an organization which fomented division and hatred among Ethiopia’s ethnicities with the sole aim of perpetuating its days in power. The irony of it all is that now it has become the main object of hatred and contempt after trying so hard and systematically to instill division and hatred among the people. We must no longer harbor any illusion that it will ever redeem itself; because for it to be redeemed means that it must cease to exist. It will continue to exist as long as mutual distrust, conflict and division inhabit the minds and hearts of those it continues to oppress. It is constitutionally incapable of promoting peace, justice and goodwill. Because it is essentially based on belligerence, division, partisanship and ill-will. It will use every means at its disposal to ensure its survival until kingdom come. The TPLF is a cancerous overgrowth that needs to be excised, eradicated and discarded down to its minutest tentacles. We must ensure that it does not only resurge, but others like it have no chance of emerging again. I would even go a step further by stating that, from here on, no Ethiopian political organization should call itself a liberation front, because, as we have seen in the case of the TPLF, most if not all liberation fronts end up subjugating the people they claimed to liberate. What Ethiopia needs is not an assemblage of liberation fronts, but political parties with clear visions and agenda. Because otherwise Ethiopia’s peoples will either survive and prosper together, or will simply become the epitome of a failed nation. It is with this in mind, that I say to my fellow Ethiopians that our enemy is within and must be defeated if a new Ethiopia is to re-emerge. Thus every Ethiopian, in and outside the country, must declare as one’s personal mission the ending of the TPLF regime. The evidence is too obvious at this point that a negotiated co-existence with the TPLF is simply impossible. It is an organization that has ceased and maintained power by the barrel of the gun. Who is naïve enough to believe that it will swap the gun for a legitimate election? When it will in fact run out of a way out from its present predicament, it will direct the full force of its military and security might against the very people it pretends to protect and serve. We must be absolutely clear that the enemy of the Ethiopian people is the TPLF, and not the people it claims to represent! The people of Tigray have suffered as much under this oppressive and corrupt organization as the rest of Ethiopia’s peoples. Let us not make the horrendous mistake of directing our anger and blame on the oppressed and persecuted majority of our fellow Ethiopians in Tigray. Our rage and resolve must instead be directed to removing from power the TPLF, the army of its cadres, cronies, spies and those who have benefitted unlawfully under its regime. Indeed, the people of Tigray having an equal stake in the nation’s future have every good reason to join in the fight to remove the TPLF from power. Those who want to wait for a fair and transparent election to materialize under the watch of the TPLF will be wasting their time and energy. What difference does it make whether the new Prime Minister will be an Oromo or an Amhara, or for the matter of that, once more another individual from one of the Southern nations, nationalities and peoples? We clearly know that the TPLF does not want to install one of its own members, not because it can’t, but it has much to gain by remaining inconspicuous. It is not that it does not want the position, it is because it has much to gain by not vying for it: by remaining behind the curtain, it can always manage the nation at will through its subordinate partners. Since the military and security bodies are clearly overwhelmingly populated, at least at the top, by members of the TPLF, to speak of a prime minister that has real and effective power is but a delusional thought. Yes, the election of an Oromo or an Amhara may in the short term appease their respective regions. But it is inconceivable that it can deliver long term stability and peace to the entire nation. No one should fall either under the illusion that a prime minister that can end the state of emergency will effectively end the turmoil we are in: As long as the TPLF is breathing down his neck, his options will be most likely circumscribed by the TPLF bosses. I need not remind those who see a better outcome from electing an Oromo or Amhara prime minister that their optimism will be very short lived. The task at hand should be clear at this point. For Ethiopians to end the present impasse there is one, and only one thing to focus upon: The removal of the TPLF. It is not an organization that clearly wants any form of compromise, nor an organization that has at heart the good of the Ethiopian people. Its sole mission is to stay in power as long as it possibly can; and will do anything, even plunging the nation into a bloodbath to hold on to power. We are facing a very dangerous enemy indeed and must proceed with caution. Because it will come for us, if we don’t organize against it. The famous Latin adage rings truer now than ever: Si vis pacem, para bellum (if you want peace, prepare for war). I say lets’ use every conceivable peaceful means at our disposal and lets exhaust every known non-violent method in the book to combat this regime. But if all else fails, we must begin to prepare to protect our lives, liberties and possessions in any way we can and by any means necessary. We are indeed facing an implacable enemy!